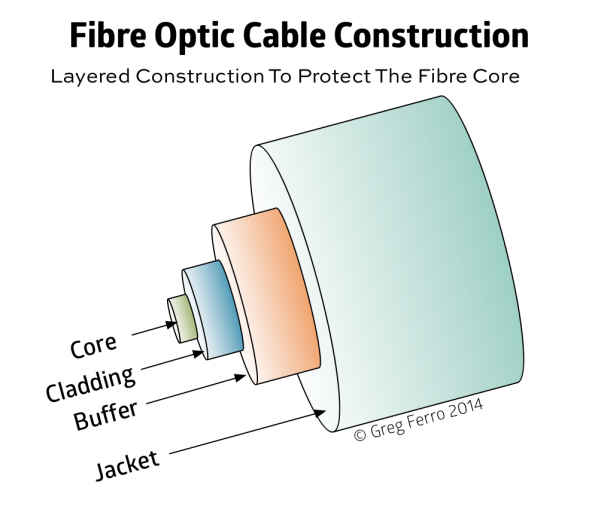 When installing Fibre Optic cable care must be taken to ensure that cable is not bent, stretched or deformed.The best case is that the fibre core will break and will become faulty, the worst case is that the fibre optic core will be deformed or damaged and cause signal distortion that results in intermittent faults. In data networking, two type of cable are in common use – single-mode (SMF) and multimode (MMF). The core is embedding in a layer of cladding that helps to protect and strengthen the cable. The cladding also contains a reflective layer that is critical to laser propagation. 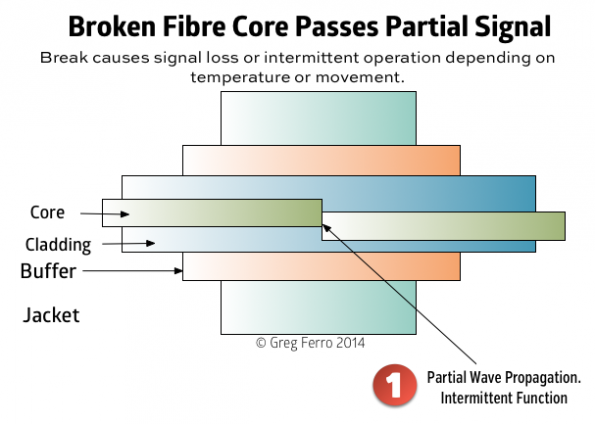 The glass core in a fibre optic cable is fragile. It is slightly thicker than a human hair but made of glass for single mode and plastic for multi-mode. Manufacturers have been able to design and manufacture the core material to be somewhat elastic and resilient to bending. Single mode uses special type of glass that is extruded into a solid medium to protect it. MMF is made from glass but being thicker (at 125µm compared to 9µm) is more robust. Because of this SMF is more sensitive to breakage than MMF. When the core is stretched or bent beyond a certain point the core will physically break into two parts. In this case, two possible outcomes are possible. The best case is that two pieces of core are not physically aligned and no laser light will propagate. A less common case is that the two core will be partially aligned after the break and pass a partial signal. This may or may not work. Intermittent operation may happen as the cable expands/shrinks with temperature, vibration or movement. A fibre optic cable relies on complete internal reflection and this scenario still supports that but a substantial amount of signal power can be lost at this interface plus reflections can further issues. 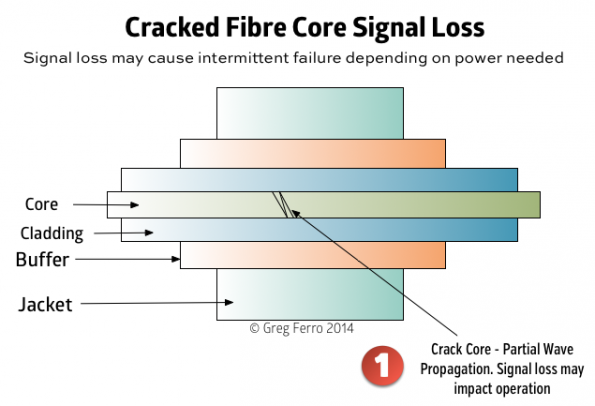 It is also possible that the fibre core might be damaged instead of a break. For SMF the glass might only crack and cause imperfection in the medium that would reduce signal propagation and causes reflections. For MMF the is more likely to be damaged by the flexing and cause power loss. In the case graded fibre, this is quite damaging to the signal as it will be badly distorted. When working with fibre optic patch leads, it is common for people to trap them in door or stretch them by pulling on them. While patch leads are designed to be more flexible compared the cabling used in risers, it is still susceptible to breakage in the best case. “Best case” means that the cable doesn’t work. Worst case is when the fibre core is partially damaged and likely to cause intermittent operation. Intermittent is much worse than broken. Another reason for replacing cables is that the fibre connectors are dirty, scratched or faulty and new cables will improve the power level received. In my opinion, thats why replacing the cable often fixes intermittent problems in network. It is very hard to test or confirm a faulty fibre optic patch lead. A faulty patch lead can cause waveform deformation through propagation distortion or power loss through a cracked or misaligned core. And according to the temperature fluctuation, ambient vibration by fans and coolers, or just being moved the network might have problems. 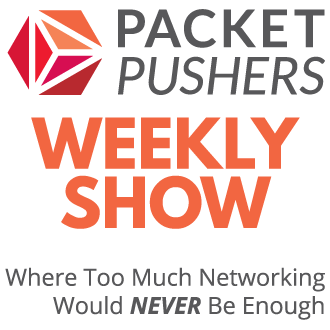 EtherealMind’s First Law of Networking is “Always Check the Physical”. This is why. 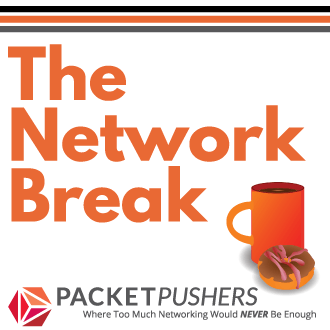 Intermittent faults as in bit error/packet loss or link flapping/carrier loss? IMHO core isn’t 125u in MMF but mostly 50u. Cladding is 125u with SMF and MMF. One line says MMF core is plastic but it’s glass.